I’m a big fan of the HP Mini 1000 and it earned our first Editor’s Choice award, but the quality of its built-in webcam is a weak point. The Mini 2140 has a similarly spec’d webcam, but it delivers a dramatically better image than the one found in the Mini 1000. The Mini 1000’s webcam has a dark filter in front of it that doesn’t let enough light through. As you can see in the below macro shot you can’t even see the camera lens. 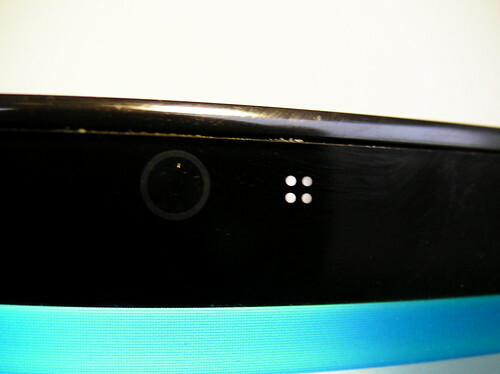 This means that there’s not enough light passing through to the webcam’s sensor. The Mini 2140 has a VGA (640×480) webcam, but isn’t cursed with a filter that darkens the image. You can clearly see the camera lens in this close up of the 2140’s webcam. Almost all of the light passes through this filter and into the camera’s sensor. Why does this matter? A darkened filter on a camera is like a person wearing sunglasses indoors. Sure, you can make out shapes of things and can clearly see a brightly lit face or object, but everything else looks muddy. Here’s a picture from my Mini 1000’s webcam that I took using the default settings. And here’s a picture using my Mini 2140’s webcam with default settings using a nearly an identical position/angle. As you can see, the Mini 2140’s webcam does a much better job of capturing my mug in a backlit setting. The Mini 1000’s image is pretty unusable in this situation. If you want to use the Mini 1000’s webcam you should sit in a very well-lit room and avoid back-lighting. I really hope HP improves this situation quickly, even if it means a less-sleek bezel. 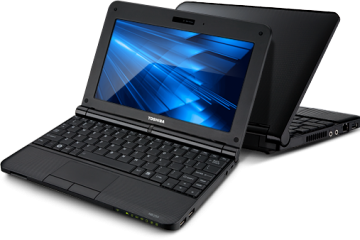 Mini 1000 TV Commercial: Do People Understand Netbooks? 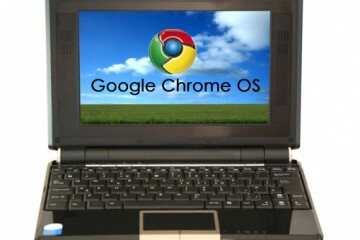 Could you comment on the clearance between the screen and the keyboard on the Mini 2140 vs the Mini 1000? I found that the Mini 1000’s keys could hit the screen, whereas the 2140 looks like the keyboard may be more recessed relative to the hinge part of the 2140. Yes, the 2140’s keyboard is recessed about a mm or two from the screen when closed. There are two rubber bumbers at the top of the 2140’s screen to make the gap more pronounced. 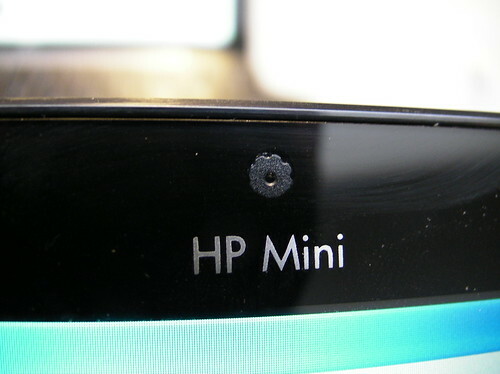 what are the LED looking lights to the right of the Hp Mini 1000 webcam? Oh, and how does the screen tilt on the Mini 2140 compare to the Mini 1000 (i thought the mini 1000 would have been better if it could have tilted a little further). I want to know the same thing, what is the maximum opening angle of hp 2140? Seems like you can’t open it too much and that would be problematic if its at your waist level for example in your lap while your sitting at the couch; the screen doesn’t seem capable of opening enough so you could view it perpendicularly in such situation? Does the opening angle depend on whether you have 3 cell or 6cell battery? There’s really no way to get a good shot of yourself on a webcam. with this small of a device if you’re sitting on a couch regardless of the opening angle. I recommend using smaller notebooks on a stand when you record video or chat to avoid up-the-nose shots. The Mini 2140 opens at approximately the same angle as the Mini 1000 regardless of the batter. The angle relative to the desk/surface you’re using it on is reduced when using the 6-cell battery because it tilts the keyboard forward by a few degrees. Xavier, thank you for sparing your time to answer these questions. I have another one i hope you will answer: What is your take on the size/weight differences between these two. I owned a Mini 1000 and LOVED the size/weight. I am hoping to get a 2140, but will i *notice* a difference or do they feel the same in everyday usage? So the Mini 2140 is less than 3 ounces heavier than the Mini 1000. The form factor is nearly identical, just slightly thicker. I’ve been carrying the Mini 2140 in my fleece’s inside pocket all week and don’t notice the difference in weight/thickness at all. where would i be able to purchase one of the 2140 minis? The Mini 2140 has been retired and replaced with the Mini 5000 series. I think you can still pick up a Mini 2140 from Amazon.com or eBay. 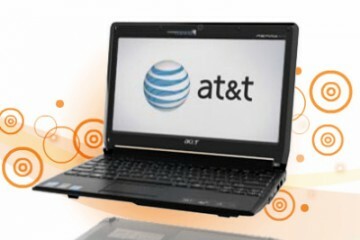 Some business-oriented retailers still carry the Mini 2140 as well. I just purchased a HPmini and noticed the mouse pad is hyper sensative which makes the curser jump all over the place when I’m writing a word document. Is there anyway to make it less sensative or to fix this issue? Cover it? Ideas? Lisa, have you tried going into the mouse/keyboard control panel? You might want to reduce the speed of the cursor. 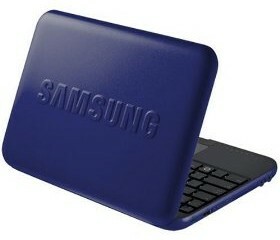 The trackpad is small, which means it will exagerate movement more than you’re used to on a full-sized notebook. I don't if you can assist me. I just bought the HP 2140. I just found out that I can't use the integrated camera during chat(messenger or skype). pls is there anything I can do to correct this? F*ckin? remarkable things here. I?m very happy to peer your article. Thanks so much and i am taking a look ahead to contact you. Will you kindly drop me a e-mail?